So, just for fun, I’ve put together a list the things I’ve heard to set the record straight (or offer my opinion, depending). Take a look at this quick list of misconceptions. Abrasive waterjets are always noisy and messy. I must have been in 1,000 shops around the world over the years. I’m sure you’ve been in a lot too. Whether there is a waterjet in there or not, some shops are noisy and messy, and others are pristine. Like any machine tool, you can minimize or maximize your work environmental problems. With an abrasive waterjet, cutting underwater makes the jet itself very quiet – as loud as filling up a bucket of water when you submerge the hose. Cutting under say 1 inch of water also greatly reduces any spray, steam, or mist when a proper pierce shield is in place on the head. A waterjet pump can blow up. If you are purchasing your pump through an accredited manufacturer, this should not be a concern for you. Since water is far less compressible than air, there is much less stored energy in a waterjet pump even than in a scuba tank. Ultrahigh-pressure pump design criteria follows strict rules and industry standards. One portion of the standard is to ensure all ultrahigh-pressure vessels are designed to “leak before break.” This means that pressure cannot be built up in areas where they could have catastrophic failure. Rather, they leak. Often through a pre-drilled “weep hole,” weeping allows the pressure to be relieved. How do you ensure you’re buying a pump that is safe? Purchase from a supplier with an ASME U3 Certification stamp. This certifies all pressure vessels are built in accordance with the ASME Boiler and Pressure Vessel Code (Section VIII, Division 3), raw material trace-ability is in place, no outsourcing of manufacture to non-certified shops, and other factors. Striations from the top to the bottom of a part are unavoidable. Striations are caused by three main things: loss of power, non-smooth motion, and material inconsistency. Loss of power as you cut through the material. If you cut near maximum cut speed, you will see a smooth portion above and a striated portion below on the cut edge. Slow down and this transition zone between smooth and striated moves downward on the part. Inconsistent motion. If the material moves or the machine jerks or changes speeds quickly you will see a mark that starts atop the part (above the transition zone) and can be traced to the bottom of the cut face. You never want to see marks going from the top of the part to the bottom of the part – this indicates something is not right. Material Inhomogeneity (voids, irregularities) . Material isn’t always the same throughout. Let’s go to the extreme case of cutting a piece of low grade aluminum that exhibits air bubbles. When the jet cuts into a cross section with an air bubble it will leave a striation mark under the air bubble. Similarly, when cutting cement made up of concrete and stone the jet will likely show striation marks below the stones because stone will have a different hardness than the concrete. The jet can be held at a fixed angle to eliminate taper all the way around a complex, intricate shape. Unfortunately, this is not a reality. If all we were doing is cutting a straight line at constant speed, we could angle the head by the appropriate few degrees to compensate for the natural V-shaped taper that occurs when cutting with an abrasive waterjet. However, machine tools naturally slow down on tight geometry, and we often want to slow down to avoid inside corner wash out caused by stream lag. Every speed change also changes the V-shaped taper angle, and so the angle must change with speed to cut a high precision part. There are solutions which exist to solve just this problem, learn more about this patented technology. 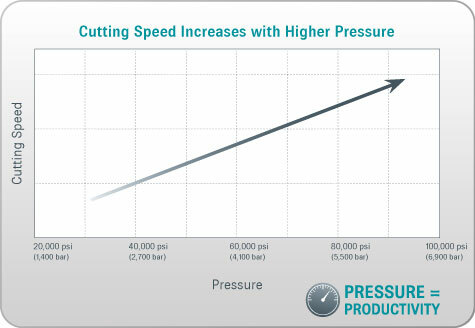 Cutting at lower pressures is more efficient. This is, unfortunately, a very common misconception. The abrasive waterjet, when invented by Dr. Hashish and his team at Flow, operated at around 30,000 to 36,000 psi (2000 to 2500 bar). The reason why waterjets have always moved up the pressure curve over the years is because they are more efficient at higher pressures. The industry has never had a trend of moving down in pressure; yet every time we reach the next pressure level we are often met with resistance to the change. That is, until they see it. Simply put, pressure equals productivity. The higher the pressure the smaller the jet diameter, the less abrasive and water is used, the faster the water and particles of sand move, and the faster you cut. When don’t you want higher pressure? When your motion equipment can’t move as fast as the material can be cut, or if you wish to purchase a lower priced system. The waterjet that exits the head is under pressure. The waterjet stream is supersonic and is at ambient pressure. What does this mean? All pressure (above the jewel orifice) has been converted to velocity (2 to 3.3 times the speed of sound) when the water exits the jewel. If it was under pressure, then the jet would just expand, but it doesn’t – it stays tight together for a bit before beginning to flare out due to wind drag on the outer layers of the jet. Garnet mesh size doesn’t matter for cut speed. Garnet mesh does have some impact on cutting speed. Larger mesh abrasive tends to cut slightly faster, but leave a slightly rougher surface finish. 80 mesh is most commonly used for waterjet cutting. 50 or 60 mesh might cut a few percentage points faster. On thin sheet metal abrasive size has little impact. Abrasive never gets to the middle of the jet in an abrasive waterjet. Yes, some abrasive does get into the middle of the waterjet stream. The better the design of the cutting head, the more abrasive gets to the middle. The waterjet puts hundreds of pounds of force on the material when it is piercing a hole through it. Roughly, only 15 to 40 pounds (6.8 to 18 kg) of force, usually about 30 for most machines, is exerted. During cutting, the vertical force is often under one pound for a high quality cut. Of course, I must add that these are estimates which would vary depending on your cutting system and application. Holding the jet still is the fastest way to drill a hole. Actually a technique we developed decades ago (cleverly) called “Piercing on the fly” is the fastest way to get through. When you hold the jet stationary during a pierce you are forcing the virgin jet to fight through the rebounding jet before it can dig deeper. Piercing on the fly can pop a hole many times faster than holding the jet stationary. The fastest way to cut off the end of a rotating tube is to come in from the edge. Actually, the fastest way is to shoot the jet perpendicular to the round material (tube or solid, doesn’t matter) and turn it on. This approach means 100% of the jet power is used to remove material. When you come in tangentially to the tube or bar some of the jet power is going right by and only the leading edge of the jet is actually removing material. That ends round one. I’d like to know misconceptions you have heard. Tell me in the comments and, as always feel free to add suggestions for my next post.